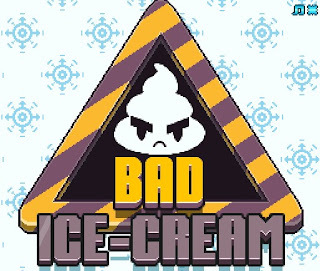 Bad Ice Cream is another top down action puzzle platforming game created by nitrome. This game features 40 levels with cute graphics like other games from nitrome. Help the ice cream world take back the winter from the grasp of the bad ice cream boys. Freeze and unfreeze ice blocks as you get all the fruits in each levels while avoiding being flattened by the enemies. Also, the game can be played in a two player mode which is a lot more fun. Anyways, if you are having difficulties trying to beat this game, here are some Bad Ice Cream walkthrough to look and learn some tricks from.